An unaltered photocopy of your WD AGO 53-55, NAVPERS 53-55, DD-214 or other Report of Separation. If your China service is not stated on your Report of Separation you MUST provide a copy of your Report of Separation AND a photocopy of other military-issued documentation displaying your China Service. This medal was authorized by the Chinese Nationalist Government for issue to all servicemen and others who assisted the Chinese in their fight against Japan during the second World War. It was awarded to both military and civilian personnel who were directly involved in the war effort. Perhaps the largest single group of Americans to receive this medal were members of the 14th Air Force, the famed "Flying Tigers." This medal was presented to them in a special ceremony during a convention of the 14th Air Force Association held in New Orleans on August 2, 1975. The medals were formally presented to about 200 veterans by the Ambassador of the Republic of China and Anna Chennault, the widow of General Claire L. Chennault, the former commander of the Flyng Tigers. This medal was established as the Medal in Commemoration of Victory in the Resistance Against Aggression, but is more commonly known as the China War Memorial Medal. 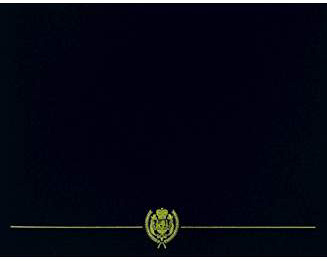 It was established by the Republic of China in 1944 and issued October of 1946. Acceptance of this medal was authorized in accordance with the provisions of Public Law 80-314, which authorized the acceptance of foreign awards and decorations during World War II for the period of December 7, 1941 through July 24, 1948. The effective dates of the China War Medal are December 8, 1941 to September 2, 1945. 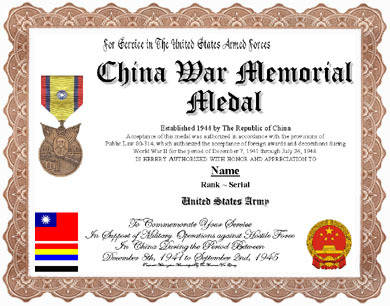 The China War Memorial Medal was awarded to all members of the Armed Forces of the United States who served in Mainland China, Burma, Vietnam, and Thailand, for at least thirty days between December 8, 1941 and September 2, 1945. This medal is worn behind all foreign decorations. When worn with other foreign service medals, it worn in the chronological order in which they were received. No devices are authorized for this medal. The design for the China War Memorial Medal was set by the Government of the Republic of China. The front of the medal shows the Marco Polo Bridge, which spans the Yeng-ding river. The bridge symbolizes the outbreak of the Sino-Japanese War, because Japan's full-scale aggression against China began on July 7, 1937, near Peking in a small town called Lukou-Chiao, which means "Marco Polo Bridge." Above the bridge are the crossed flags of the Republic of China and her Armed Forces, symbolizing unity of the Chinese people. The portrait between the flags is that of Chiang Kai-shek, who was Chairman of the Military Committee of the National Government during the war. In the background over the bridge can be seen a city with smokestacks, alluding to the return of peaceful pursuits. The reverse of the medal contains a raised panel with the impressed notation, No. A, presumably to allow for the engraving of either the recipient's name or an issuing serial number. Above and below this panel are Chinese characters indicating the nature and purpose of the medal. The ribbon contains a center stripe five-eighths of an inch wide, bordered on either side by a blue stripe one-eighth of an inch wide, and a red edge stripe three-sixteenths of an inch wide. A round metal Chinese sunburst emblem is placed in the center of the ribbon.